The app is organized primarily into Photos, Shared, Albums, and Projects tabs. Users can narrow down content further through Moments, Collections, and Years views, which group files according to date and location metadata. One of the core features is iCloud Photo Library integration. This lets users upload media in its original resolution and access it from any iOS 8 or OS X Yosemite device, as well as Apple's iCloud.com interface. Editing an image on one platform will automatically apply the same changes on other iCloud-linked devices. On iOS, though, only smaller versions of files are saved locally in order to preserve storage space. 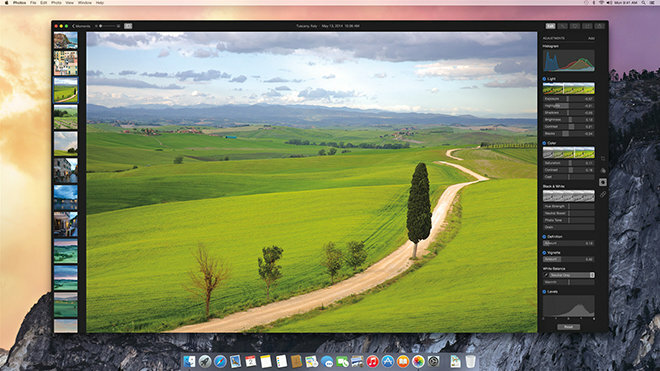 The Mac software's editing tools are similar to those in Photos for iOS, letting users adjust image setting parameters automatically or through a series of slider bars for values such as exposure, contrast, and shadows and highlights. These are relatively basic, however, compared to professional suites such as Aperture, Lightroom, or Photoshop, which have many more parameter controls, and a broader array of tools like brushes and plugin extensions. Photos includes just eight filter options. Photobook creation has been simplified, and given an assortment of new Apple-made themes and square book formats. When buying prints through the app, square and panoramic options have been added. In tandem with Photos' launch, Apple has posted a quick start guide for help on tasks like migrating from iPhoto and Aperture, enabling iCloud Photo Library, or backing up to Time Machine. The company notes, for example, that iPhoto and/or Aperture will remain installed, and that migration should happen automatically if a person has a single detected library. If two or more image editing apps are saving to the same location —which defaults to a Mac's Pictures folder in Photos —they can share the same master files. iPhoto Events are automatically converted into albums, and placed within an identically named folder under the Albums tab. In some cases, metadata like flags and star ratings will be turned into search keywords. On iCloud Photo Library, Apple notes that iCloud will only keep the user-designated System Photo Library up to date on all devices. Changing that library causes the new one to merge with the old one in iCloud. Today's release of OS X 10.10.3 and Photos was also accompanied by the launch of iOS 8.3. In release notes for that firmware the company revealed that iCloud Photo Library is officially out of beta, a status it has held since last year.